Mama’s challah. Or as my mom calls it: “the BEST challah.” And she’s right. The recipe from start to finish takes time (approximately 3 hours) so I either make it Thursday night or Friday afternoon when I get home. I prefer making it Friday so it’s fresh and warm out of oven; Here’s the secret: you spread a little butter, sprinkle a little salt and you’ve got heaven on earth in the shape of braided bread. Since this makes two loaves we usually have one plain and one raisin. And as anyone who’s anyone knows, challah makes the best french toast and/or peanut butter and jelly sandwiches. 1. Mix in tall glass: 3 T. flour, 2 tsp. sugar, both packages of yeast. Stir mixture slightly then add ¾ cup lukewarm water (100-115. measure using liquid thermometer) Let this bubble & “rise” to brim of glass for about 10 minutes. (NOTE: This should bubble up to the top. If it doesn’t start to foam within in a few minutes, try again with warmer water.) In the meantime…. 8. Mix everything with wooden spoon at quick pace! When it’s too thick to mix with spoon, transfer dough to floured wooden board or other surface for about 5 minutes. 9. Keep hands floured, add small amounts flour by hand when dough gets sticky. It should be smooth…not too loose, not too, firm, not too sticky. Scrap off bits of dough from board, so surface is clean, & smooth. Form into a round. 10. Lightly oil another large bowl, place dough in bowl, turn over to coat with oil.Cover bowl with lightly damp towel. 12. Place bowl in oven for 45 minutes / 1 hour. At 45 minutes check to see if doubled in size. 13. Remove bowl from oven, dip fist into flour, very gently punch 10-12 times to punch out air. 14. Knead again on floured board 5 minutes, add a bit of oil to bowl again, make round; return dough to bowl, cover, return to oven, let rise again 30/40ish minutes. 15. Punch down again, knead into a round. Gently divide into 2 loaves with sharp knife… do not saw. Pre-heat oven to 350. 16. Place 1 loaf aside in bowl. With remaining loaf, knead with 1 hand into ball (NOTE: if using raisins, add them here), then divide into 3 pieces, braid on lightly floured board. Roll out, fatter in middle, skinny on ends of each rope. Pinch ends together, tuck under. Repeat with other loaf. 17. Place on oiled cookie sheet. Make egg wash – mix 1 egg & a bit of water, brush over loaves. Bake 30 minutes. I love you, you are the BEST!! 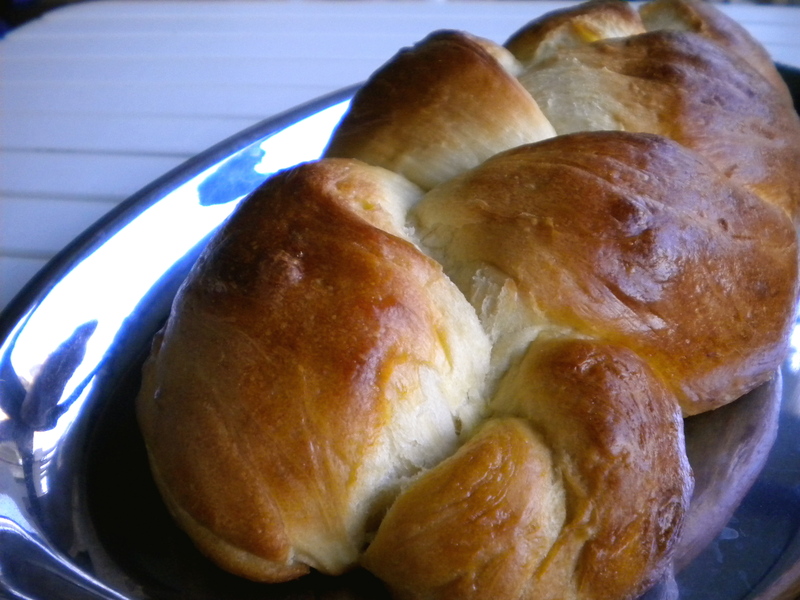 Emily – I love this Challah! It also makes a great toasted bread for a squish sandwich. Toast bread then assemble: bread-slice of cheese-bread– squish!! This looks REALLY yummy. Thanks to you and to your mom (hey, Emily’s dad, sorry about the secret, but you raised a daughter who shares)…………….. Thanks Tinky! Happy Thanksgiving to you too! I agree! This was DEFINITELY the best challah! Thanks so much for the recipe!! Pingback: Featured on Foodista! « Voila! I once shared a house with a crazy baker, who made the best Challah bread. I’ve since lost his recipe and acquaintance, so I’m eager to try your recipe. Looks delicious and substantial — as bread should be. thanks! Pingback: Bread Pudding with Rum-Brown Sugar Sauce « Voila! Pingback: High Holiday Recipes « Voila! Pingback: Fig, Olive Oil and Sea Salt Challah | Voila! Pingback: 2014 Here I Come! | Voila!